It has the possibility to change the style in easy manner and create dynamic news, or you use static file menu.html file instead of menu.asp. It use TinyMCE WYSIWYG editor to generate news, It is really simple use It on our apps. I have developed a capctha in ASP. It can be developed in different manner, for example with images. In this version I have used random questions. Recently I want add Mailing list to a my website. So I went to hotscriipts and other websites to get an application for this. But i see many applications were not free. 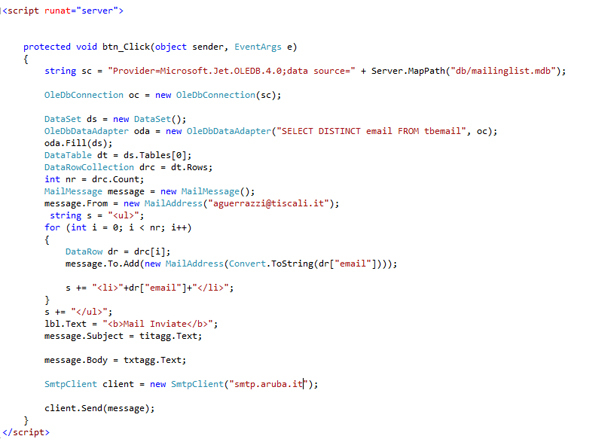 So I decided to do the application with ASP.NET. I implemented this with the old System.Web.Mail namespace that use CDOsys. But this is deprecated, so I have reimplemented this with new libraries and new namespace System.Net of the new Framework.